We’re back from a whirlwind trip to the Twin Cities. We attended two full days of Frostbike, Quality Bicycle Products‘ famous winter trade show. We love QBP for a lot of reasons, and this show is definitely one of them. We get to be face-to-face with a huge group of vendors and their wares, which means we get to check out product in-person and ask lots of questions. We also come away with fresh ideas and inspiration. Pacific Outdoor Equipment is a company based in Bozeman, MT. Their bike gear is designed for touring and commuting, and it’s really well designed stuff. We got to inspect their dry sack style panniers, and we were impressed. Check out their site for bags as well as a wide range of other outdoor gear. The Blaze LED lights have proven to be some of the best commuter lights around as well as great touring lights, especially if paired with another light for serious night riding. I (Cody) built up a 3-watt SRAM i-Light front wheel last fall to connect to my Blaze Dynamo, and I absolutely love it. No more batteries and the light is brighter than any LED I’ve ever owned. If you’re interested in human-powered lights, come talk to us. We can hook you up! 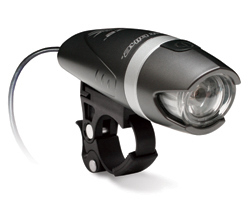 As pictured the Sport Spot is a headlamp, which can be used for all manner of activity, including cycling, but what’s better is that it can attach to a mount on your handlebar or helmet to be a more efficient bike light. Get to the campground, take the light off your bar, and strap it to your head. Set up that tent hands-free! We even got to try it out when we got back into town. 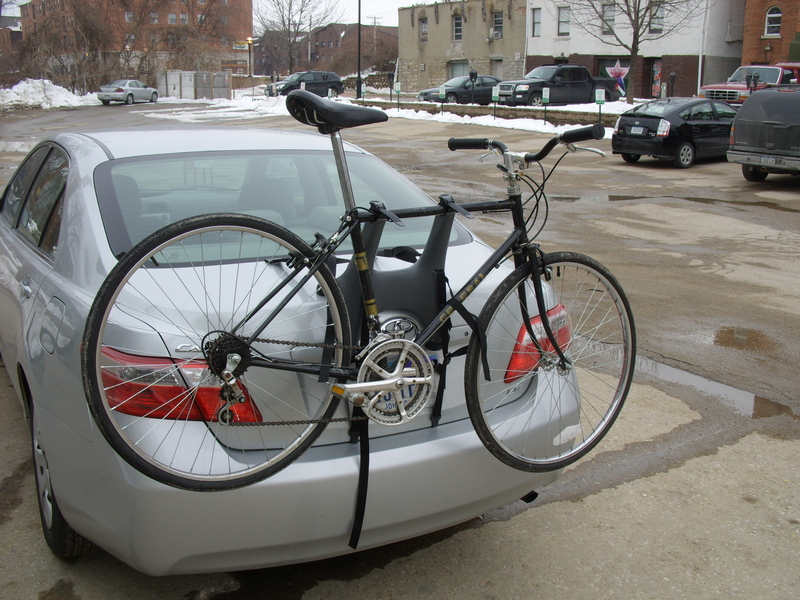 Steve put this bike on the rack, so he could return the car to the rental place and still have a vehicle to get back to the shop. The little rack is so lightweight that he just held it under his arm as he rode. There’s lots more that got our attention, so stay tuned. We’ll keep reporting as we inch ever closer to Spring. great product reviews! i’m really enjoying your shop from–sadly–afar. Yeah, I’m glad we got to talk to you, too, dp. And, we’ll be posting soon about the wonderful wares of Portland Design Works! It was great to (re) meet you both this weekend!